"Overall a very solid language learning program." Fluenz Spanish offers an innovative new way to learn Latin American Spanish that has proved immensely popular with many language learners. The review of the Spain version is located right here by the way. Essentially it takes the experience of one on one tuition and translates that into language learning software. Using a customized, progressive approach which increases in difficulty as you work your way through the program. Fluenz Spanish is significantly different to the way that Spanish is taught with programs such as Berlitz or Rosetta. The purpose of this review is to explain those differences to you, so that you can make an informed purchasing decision and buy the language learning software that is right for your situation and learning style. Here you will find out the strengths of Fluenz Spanish, as well as some of its weaknesses. 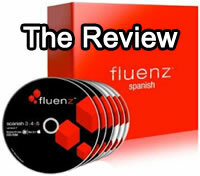 At the end of the review, I will provide a overall recommendation for Fluenz Spanish. Fluenz Spanish 1 + 2 + 3 + 4 + 5 contains all five levels of the Fluenz Spanish learning program. Using this program you can go from not knowing any Spanish through to an advanced learner. The program contains 150 separate sessions. Each of these sessions is up to two and half hours long. In each of the video lessons, uses a video tutor, who guides you through a workout. This will cover aspects of conversation, reading, writing and listening. Fluenz Spanish 1 + 2 + 3 + 4 + 5, is available for $398. This includes free shipping anywhere in the United States. Innovative Teaching Style - Fluenz Spanish is very unique in its teaching style. The program mimics the experience of having a one on one tutor, taking you through progressively more difficult language activities. It is easy to get a sense of the progress that you are making, and before you know it, you are engaging in a full conversation with your tutor. Looks Fantastic - Fluenz Spanish has the highest production values of any language learning software that I have seen. It looks great, and the interface is very intuitive and easy to operate. Sonia Gil is a highly professional tutor and makes for a very pleasant teacher. Removed Voice Recognition - Voice recognition is one of those concepts that looks good on paper, but doesn't quite work as well in practice. One of the biggest complaints about programs like Rosetta Stone and Berlitz is the quality of the voice recognition. Even single syllable words often cannot be recognized using the software, which is frustrating and causes unnecessary delays in your progress. Fluenz has cleverly recognized this problem and removed voice recognition altogether. Instead when you engage in conversation, you are given a space to record your voice. You can then play it back and compare it to what it should sound like. This allows you to make progress with your pronunciation, without having to spend time on voice recognition software that rarely works properly. Focus on Practical Spoken Spanish - One of the best features of Fluenz Spanish is that it focuses on teaching how to speak practical, modern Spanish. Some more traditionally minded Spanish language programs teach words that are rarely used. Fluenz in contrast teaches Spanish as it is spoken today. Challenging - The Fluenz teaching method requires that you put together your own sentence constructions very early on in the program. This is much more challenging than Rosetta Stones "Pick the word approach". While the Fluenz style harder, you can see that you are making progress faster as well. Being able to construct workable sentences is what gives you actual Spanish speaking skills. Fast voice narration - The male speaking voice is fast. This means that you sometimes need to replay it multiple times before you pick up everything that he says. Like other aspects of Fluenz, this is challenging but it does force you to make rapid progress with you Spanish listening skills. Videos are displayed at a fixed size - The videos on Fluenz are displayed at a fixed size and cannot be adjusted. This is fine for most normal sized laptops or desktops, but if you have a large screen for your desktop computer, it can leave a lot of black screen around the image. One way to get around this problem is to reduce your screen resolution, which makes the videos appear larger. No transcript - One thing that Fluenz lacks is a transcript of the conversations. Some people like a transcript so that they can review it at a later date. While this won't be important for everyone, for people who like to see things written down, this could be inconvenient. The feedback for the Fluenz Spanish has been overwhelmingly positive, with many students saying that they prefer it to the Rosetta Stone methodology. Fluenz Spanish is a very high quality product, with excellent production value and an easy to use interface. With five different levels of learning, it can take you from a complete novice to an intermediate to advanced Spanish language learner. I also like that it focuses immediately on the most relevant Spanish words right away, so that even new learners can gain workable Spanish by the end of level 1. In terms of price it is comparable to similar Spanish language products produced by Rosetta and Rocket. There are less expensive alternatives, such as the Berlitz Spanish Premier program, but Fluenz Spanish has far more features and is considerably more extensive. If you are serious about your language learning, and want to go just beyond the basics then Fluenz is a very good choice. While there are a few minor faults with the product such as being unable to slow down the narration and a lack of transcript, overall this is a very solid language learning program. The system is easy to use and develops real Spanish speaking skills. I's in my opinion a much stronger product than Rosetta Stone. However, Rocket Spanish still remains my "Editor's Choice". If you are looking for a comprehensive Spanish Language program, then I recommend that you check out the comparison first.